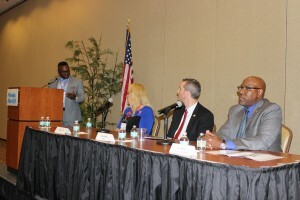 On November 9, 2016, the Florida Diversity Council held its Fifth Annual Veterans Summit at the Florida Blue Conference Center in Jacksonville. The Veterans Summit is targeted towards business leaders and strives to teach organizational representatives how to develop best practices that cater to veterans in the workplace. Mark Walters, Event Chair, opened the event and introduced Keynote Speaker Bobby Carbonell, Executive Director of Veterans Florida. During his keynote address, Mr. Carbonell discussed the function of Veterans Florida – to make Florida the go-to destination for Veterans exiting the military – and how employers can lead efforts to make the state more veteran friendly. The summit included breakout sessions on “Bridging the Veteran Employment Divide,” and “Onward to Opportunity: The Employer’s Perspective,” and concluded with an executive panel session on “Best Practices for Recruiting and Retaining Veterans.” Business representatives from the private sector and academic institutions, who most of whom are also veterans themselves, served as panelists for these important topics and shared their valuable insights and experiences. Attendees left the summit equipped with knowledge and best practices gained from the speakers on best practices that they can take back to their own organizations. The Florida Diversity Council would like to thank the event planning committee, speakers, volunteers, and attendees who helped bring this event to fruition. A special thanks is also given to the event sponsors, without which the Fifth Annual Florida Veterans Summit would not have been possible: USAA, Florida Blue, Fortegra, Saint Leo University, Bloomin’ Brands, and Adecco Group North America. Program booklets, photos, and other post event articles can be viewed on the Florida Diversity Council Event Timeline.